Bianca Andreescu hopes her BNP Paribas Open title win can be an inspiration for other young athletes. The 18-year-old, who will compete in Rogers Cup presented by National Bank in August, became the first Canadian to win a WTA Premier Mandatory championship and the youngest player to win at Indian Wells since Serena Williams 20 years ago. “Hopefully this moment can be a great inspiration for young athletes because, like I always say, if you believe in yourself anything is possible,” she said on-court, following her 6-4, 3-6, 6-4 victory over Angelique Kerber. 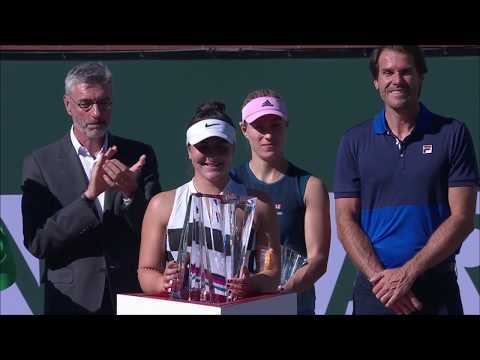 Andreescu had to dig deep to ensure her remarkable run to the final was capped off with the trophy. Kerber, 31 – a three-time Grand Slam winner – was as tough an opponent as the teenager has faced throughout the tournament. During the match, Andreescu called on her coach Sylvain Bruneau for advice. Those conversations seemed to provide the 18-year-old with a new lease of life, giving her the confidence to go on and win the trophy. Following the on-court celebrations, Andreescu spoke to the media and discussed the surreal moments in the locker room after her victory. She said: “I was actually really dizzy in the locker room because there were so many thoughts, so many emotions going through my body.